True Swords has an unprecedented savings opportunity for you with our first-ever bargain basement scratch & dent inventory reduction sale. 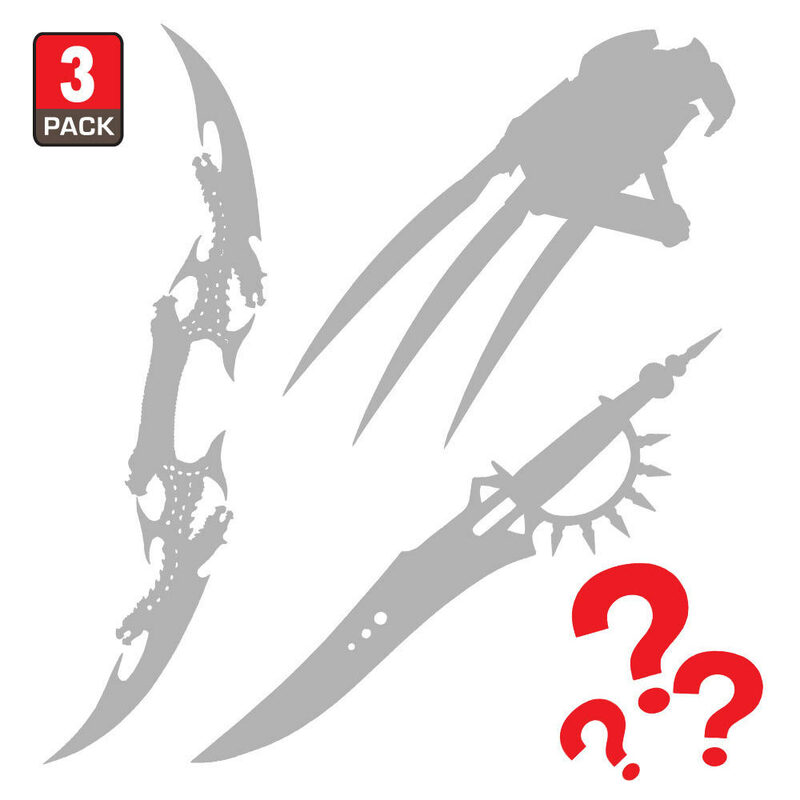 This scratch and dent grab-and-go three-piece Fantasy Knives Mystery Bag brings you three blades at one low price! For less than $20, you'll receive a combination of three stylish fantasy knives in this mystery bag. We've found a stash of scratch & dent pieces that are still in full working order, and we're passing along this opportunity for incredible savings to you. Pick up four blades for less than $7 each! Bought this recently and was surprised at how it worked out. I received first a long ornate dagger with a sheath, it has minimal damage around the area where the the sheath and handle meet when put together and the blade has absolutely no edge. However the engaved artwork on blade is amazing. Definitely for looking at not for use. The second was a smaller dagger with a symmetry problem but a very unique blade shape, not a bad concept at all but again absolutely zero edge, it may not even cut butter. And lastly what made it all worth it was a steampunk fantasy sword and sheath! The value of which is well over the $19.99 i paid for this bundle and it was in awesome condition!! Not sure why it was scratch and dent at all. It looks amazing!!! So all in all i think it was worth it got some functional and decorative items out of it and am very satisfied. You never cease to impress me budk!! ok so here it goes i've noticed no one has wrote a review for this item so i will. i decided to take a chance on this and see what i get . first i got a really weird but cool gauntlet i wanna say it was on trueswords and labeled a tiger shark gauntlet it has a lot of sharp edges but its not a practical weapon but what scares me are the ice pick things coming out the back one at about 6in the other at 4in u could hurt someone with those for sure came with the wall plaqe so i hung it up downstaires out of childrens reach . 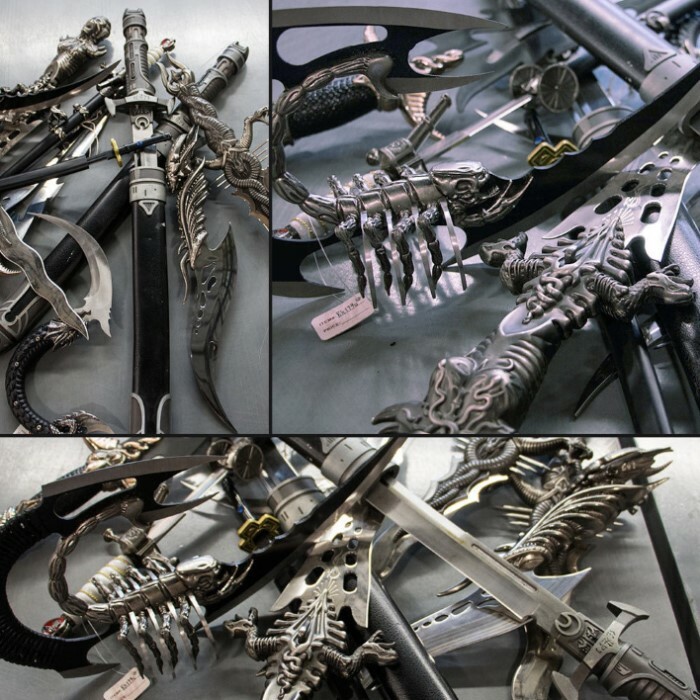 next was a dual sword pole staff thing its ok but if it was maybe 5 feet i would like it more lastly was a sword cane gave it away but all in all i got my moneys worth and do want to try this deal again.